Please Note: This set-up tool is intended for use beyond simple audible testing. Certain tools are required to achieve intended results, including and most notably an Azimuth Range Meter like the Fozgometer (http://store.acousticsounds.com/d/65758/Musical_Surroundings-The_Fozgometer_Azimuth_Range_Meter-Turntable_Set_Up_Tools). 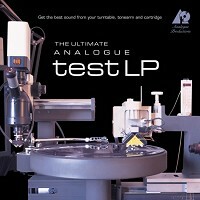 Analogue Productions set out to produce the ultimate test record. This record was pressed at Quality Record Pressings on 180 gram vinyl. Customer Reviews (4.75 Stars) 8 person(s) rated this product. I have this test LP and a Fozgometer and it was very easy to adjust the Triplaner MK VII to get the results on the Fozgometer as per the instructions. Please explain. When properly configured, the azimuth tracks 2 and 3 must be in phase or antiphase? This test record is amazing, a valuable tool, but its full value is for those with a deep body of technical knowledge on TT set-up. Despite my decent experience and fair degree of reading, I was unable to fully utilize and benefit from the lp--mainly due to knowing how to set-up, yet not the proper terminology, and lacking the additional testers/counters. Nevertheless, side 2's anti-skate test, "demagnetization" tracks, out-of-phase and resonance anomalies tests, and, especially, the silent groove to test for bearing rumble and TT isolation are extremely helpful and far more "do-able" and generally comprehensible. An insert with more detailed instructions for the less technically savvy would be a superb addition (esp. given side 1's important tests)! In conclusion, if your technical knowledge is high and tools ample, you ought to own this test record; if your knowledge is more experiential than properly terminological, expect about half of it to be useful and half to be baffling. Most of the tracks on this LP are useful. But the two tracks that you use to set cartridge azimuth (the 1 KHz left-channel only and 1 KHz right-channel only) are way too short to be useful. Measuring crosstalk takes time, and there simply isn't enough of either of these tracks to allow you to do this without stopping what you're doing, starting back at the beginning of the track, until you've got it right. But the record is nicely pressed and packaged, and the constant 3150 Hz, downsweep, and silence tracks are very good diagnostics. I was one of the guys who worked on this disk and want to thank everyone else who made this and those who have suggestions for use and comments posted. It is always a challenge to figure out what to put on a disk and jacket, where to put it, and how to repair and align the cutting lathe and tone generators (my job) for the easiest presentation (etc.) I want to especially thank George Marino and Barry Wolifson for their friendship and general technical and artistic excellence. Also, the people at RTI, who paid more attention than their normal excellent job to press this disk and do justice to the rock steady VMS-80 attributes, didn't hang up when we asked them to run the press cycle for longer than normal. Thank you all again and keep posting! Setting up your cartridge properly is a daunting task (at least it was for me). The 'Analogue Productions - The Ultimate Analogue Test LP' makes it not only doable, but is essential if you want your cartridge aligned properly. I would recommend using an oscilloscope to get the most out of the LP. To avoid one pitfall, on setting up the azimuth with Tracks 2 and 3 on Side 1, look at BOTH channels on the oscilloscope, not only minimizing and equalizing the crosstalk in the non-signal channel, but also maximizing and equalizing the other (signal) channel simultaneously. Without doing this, I found it difficult to find 'the' critical point. Otherwise, I found the test LP very accurate and easy to use. After using this test LP, my cartridge/arm/turntable sounds MUCH better than it ever has. By the way, this equipment comprises a VPI TNT Mk. IV turntable, Wheaton Triplanar VI tonearm, and Transfiguration Temper Supreme cartridge.